At the doors of the Valnerina valley, immerged in the green along the S.S. 209 road, at the center of the fluvial park of the Nera river, the country farm house "Le due Querce" is the ideal place to rest with quietness and to regenerate the body at the contact of nature.Countryside villa, recently restructures, offering 4 rooms with common services and kitchen with chimney, two mini apartments with independent entrances, but if required which can communicate together, area equipped for campers and tents, large garden with covered veranda, ideal for open air parties. 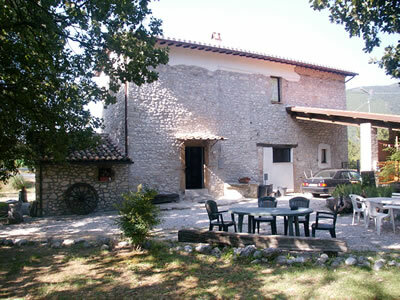 There is the possibility to buy in the country farm house olive oil, fresh eggs, honey, cheese and truffles. For about 30.000 square meters the structure is close to the Nera river, where one can practice trout fishing. In the immediate surroundings are present sport equipments for torrent descent, horseback riding, canoe, mountain bike, and for the lovers of sport climbing one can adventure himself on the beautiful walls of the rock of Precetto. We organize transfer service from/to the airport and the railway station by private car.